The third fatal Amtrak crash in less than two months has thrown a spotlight on delays in installing congressionally mandated technology designed to automatically slow trains and prevent collisions. In the most recent episode, work to install the new system, known as Positive Train Control, might itself have contributed to the crash outside Columbia, South Carolina, on Sunday, federal officials said. Employees had temporarily lowered the safety protections on the set of tracks where an Amtrak train en route from New York to Miami rammed into a parked CSX Corp. freight train. 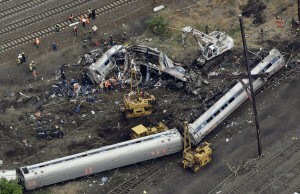 Two Amtrak employees died and more than 100 people were hurt. The collision would not have occurred if a PTC system had been functioning there, said Robert Sumwalt, chairman of the U.S. National Transportation Safety Board. The NTSB said the same thing after an Amtrak train derailed near DuPont, Washington, on Dec. 18 when an engineer failed to slow down for a curve, killing three people. PTC would have sensed where the train was and automatically slowed before it reached the curve. Despite the NTSB’s decades-long recommendations for PTC, and Congress in 2008 mandating it by 2015 on critical sections of track, many railroads are still years away from completion. In late 2015, when it became clear that railroads wouldn’t meet the deadline, lawmakers extended it until this year. If railroads install PTC equipment across their systems and get it operational on at least half of their lines, they can take another two years to complete the task. The other fatal Amtrak crash occurred last Wednesday in Virginia when a train carrying Republican lawmakers struck a trash truck driving through a grade crossing. An occupant of the truck died. The PTC systems mandated by Congress can’t detect vehicles at a grade crossing, so it wouldn’t have prevented that accident. However, some similar systems do monitor grade crossings, like along a section of Amtrak rail in Michigan. PTC was also raised as an issue Tuesday at an NTSB meeting to conclude investigations into two New York-area transit system accidents. Within 13 weeks in late 2016 and last year, trains operated by New Jersey Transit and Long Island Rail Road slammed into posts at the end of rail lines after engineers failed to stop. The crashes killed one and injured more than 200. Scene of a deadly Amtrak train derailment, Wednesday, May 13, 2015, in Philadelphia. Because of PTC’s limitations, neither transit system could use the safety system within the stations, so it would have been unable to prevent either accident if it had been installed. The NTSB issued a recommendation calling on U.S. regulators to develop another automatic system that works in stations. U.S. Federal Railroad Administration data shows that railroads carrying people have on average lagged far behind freight systems in installing PTC. Amtrak is an exception and has almost completed its installation, according to FRA data. However, most U.S. rail transit systems are lagging, according to FRA. New Jersey Transit, for example, had completed installing just seven percent of required PTC hardware through the end of September. Overall, passenger lines are operating PTC on 24 percent of their route miles, compared to 45 percent for freight systems. Railroads have encountered many technical hurdles that made implementing PTC more complex than first thought, according to the Association of American Railroads, an industry trade group. Companies must equip locomotives with PTC technology, install thousands of wayside signals and communications towers as well as build up the network of computer servers to make the system work, each with its own set of challenges. CSX, which owns the track where Sunday’s crash occurred, declined to comment on the NTSB account, other than to say that it was cooperating with the investigation. The Amtrak train was diverted from the main railroad track to a side area where the CSX freight train had been parked. The switch connecting the main line to the side area hadn’t been returned to its normal position after the freight train entered the area, according to the NTSB. Before the NTSB briefing on Monday, Bryan Tucker, a spokesman for CSX, said that the railroad was on schedule to meet the 2018 deadline for installation of PTC and to have the system fully operational by 2020. As the railroad performed maintenance to install PTC in the South Carolina stretch of track, workers disabled signals that normally warn train engineers of hazardous conditions. Such operations are permitted so long as an engineer gets permission to operate from a railroad dispatcher, Sumwalt said. He declined to say what CSX workers have told investigators about what allowed the switch to remain in the wrong position and what the Amtrak train’s dispatcher, who was also a CSX employee, was told about the status of the track. Freight railroads have completed installation of PTC on 56 percent of required rail sections, according to the AAR. Commuter rail systems are not included in the totals. Amtrak has finished the work on track it owns between Boston and Washington. Implementing the system has taken railroads longer than expected, according to Tom Schnautz, an assistant vice president of Norfolk Southern Corp. He said his railroad had planned to install track-side monitoring systems and radio antennas concurrently but had to halt antenna installations for a year because of lengthy regulatory reviews it had not anticipated at the outset. The cost of the system is expected to exceed $13 billion just through this year, according to the AAR. Railroads have at times been their own worst enemy developing PTC, said Steven Ditmeyer, a former official at the U.S. Federal Railroad Administration who teaches rail management at the University of Delaware. PTC uses global-positioning satellite technology and track sensors to monitor every train’s location and can automatically slow or stop a train if there’s a speed restriction or obstruction ahead. It can also be a huge efficiency boon, allowing trains to operate closer together and speeding arrivals, according to Ditmeyer and a 2004 Federal Railroad Administration study. Railroads could save from $937 million to $2.1 billion a year with PTC, the study found. “Most of the railroads have ignored the business benefits that can derive from this technology,” Ditmeyer said. That has, in turn, created incentives that have slowed its introduction, he said. Whether the latest accidents will push PTC into operation sooner is an open question. Augustine Ubaldi, an engineer at Robson Forensic Inc. in Ohio who has worked on large railroad infrastructure projects, predicted there will be growing pressure by lawmakers to install the system. But it would be a mistake to move simply for political reasons, Ubaldi added. The complexities that have delayed its installation are legitimate and railroads should be allowed to use simpler technology, he said. In addition, Positive Train Control won’t prevent some railroad accidents, like derailments because of defective tracks. “I don’t want people to think it’s a magic bullet and we won’t ever have enough another train derailment as soon as PTC goes into service,” Ubaldi said.